For all of you planning to go long in 2018 in the search for ETU Medals, the important and exiting news for you is that the ETU European Triathlon Long Distance Championships will be hosted, on September 23, 2018 over an challenging and amazingly beautiful course crossing National Park and finishing in the heart of Madrid at Puerta del Sol. It will be hosted by Challenge Madrid. ETU President, Renato Bertrandi, expressed satisfaction that the change of event and venue was managed so early in the season so as to reduce the impact upon athletes who were training for this longest of tests. “It is of course unfortunate that for a very few people, this change may have initially created a scheduling problem for them but with the move to Madrid happening over nine months ahead of the event I am sure that there is every chance that the necessary adjustments can be made to any annual leave or work commitments so as to enable them to come to Madrid and race in September. I am grateful to Zibi Szlufcik and his team from Challenge Family for having acted so swiftly and for having chosen the Madrid course to focus their European Championship attention upon. The choice of Madrid will make it a real challenge and how appropriate is that! 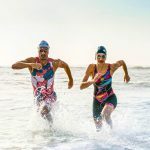 For those of you heading to Madrid, you can expect a nice and flat swim and a relatively flat run but the bike will test you all the way around. The swim will be 75km outside the city in a location surrounded by oak and pine forests and situated in the Lozoya Valley. Slap bang in the middle of the “Sierra Norte” mountain range, this is one of the most enchanting and attractive touristic areas of the region of Madrid. For more information, just Google “Buitrago de Lozoya”. Swim course: Riosequillo reservoir, Buitrago de Lozoya, 3.800 metres. Off to the bike and this is where you will need to be well-prepared. This is very definitely not a race to enter if you are not fully prepared. You start in the Sierra Norte and will then pass through fabulous locations in the Madrilenian Sierra, following the tour of the mountain passes with the big climbs at Canencia, Morcuera and Cotos. The 171 km course will go through the following locations: Starting line at swimming facilities of Canal de Isabel II in Buitrago de Lozoya, passing through Villavieja de Lozoya (km6), San Mamés (km 9,9), Gargantilla (km 13,7), Canencia village (km 22,8), Canencia Mountain Pass (km 32,3), Miraflores de la Sierra (km 38,4), Morcuera Mountain Pass (km 49,1), Rascafría (km 63,4), Cotos Mountain Pass (Km 79,9), Navacerrada Mountain Pass (km 86,4), Fuente del Ventorrillo, El Escorial, Valdemorillo, Villanueva de la Cañada, entering Madrid along the M-508 road, crossing Casa de Campo and arriving at Explanada del Rey in Madrid Río. Oh, and there is a big climb in the final stages of the run – to really test you. Click here for the video of the bike course. T2 transition area will be set up at Explanada del Rey in Madrid Río and this is where you will start the final leg of 42k on foot. The final run is 42 km and 195 metres. After leaving T2 at Explanada del Rey in Madrid Río, you head towards the river zone and your lapped course in the Madrid Rio area. A final ascent to the Cuesta de la Vega, which becomes Mayor Street and then to the Puerta del Sol with the Finish.